What an absolute joy to be a part of Ali and Nick's day! Ali and Nick are two of the kindness, most genuine people we've had the pleasure of working with; intentional about every moment and every tradition they wove into their wedding. Getting to photograph the people they cared about was a joy, and photographing them especially so. Celebrating with them at the beautiful Sherrills Inn (a symbol of the years Ali spent here in the Asheville area) was the perfect place and atmosphere for these two to make their union. I absolutely adore when couples create a day that allows their true selves to shine through. Usually, you'll hear that a wedding day is only about the couple and should disregard other people's expectations- yet Ali and Nick found the perfect balance of adding truly unique touches and loving on their family so intentional, so beautifully. It's true, you can have everything you want in a wedding and still pass on love to the people supporting you. The getting ready moments with a couple is always one of my favorites. Whether we only have a few minutes or a couple of hours, these moments are quick to define the pace of the wedding. With only the closest friends and family present, the tone they set by their words and actions tends to be how the rest of the day follows and how everyone follows suit. Ali and Nick's friends were full of laughter; quick to pay attention to the little details and smoothly, effortlessly crafting the atmosphere of their day. 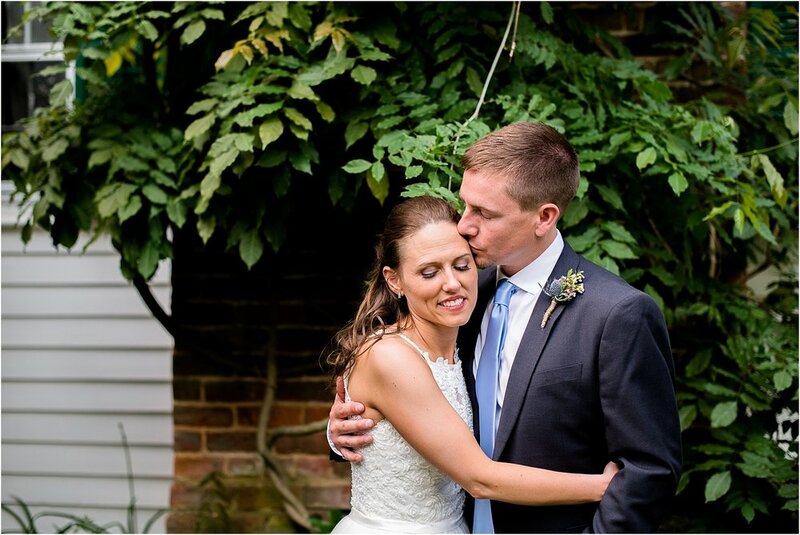 As a result of their encouragement and thoughtfulness without their day, Ali and Nick's wedding was truly relaxed, with the important things front and center instead of smaller details that can tend to take the spotlight. Family and laughter, friends and dancing, speeches and cake. Finding these kind of friends - the ones that pave the way and support you every step of the way - now that is truly special. So although we don't typically share family photos on blog posts, I have to make an exception for Ali and her brothers here. Just pieces like this - photos like this- reflect how truly family was the center of their day (and how wonderful it can be). Here, her brothers cooperated for a formal photo - but then were quick to deviate and make her laugh. You know the kind from your own siblings and childhood friends- remember that fully body, head to toe laughter? The kind that comes only from the people who have known you your whole life? That's the kind of laughter that radiated when Ali and her brothers were together. We got a quick moment before the ceremony for Ali and Nick to have a 'first touch' together. Meant to cultivate a moment of togetherness - especially since the day moves by so, so fast- these can be especially emotional and memorable. Ali and Nick's was no exception. For just a few, brief moments, Ali and Nick met together and shared a few, sweet words we didn't hear- and that's what makes it special. For her bridal session a few months back at Old Sherrills Inn, we stood in the very space the ceremony would take place. Then, it was empty - marked by some bushes and a empty platform. Today, however, was a different story. Filled with perfect shabby-chic carom and lovelies of arbors, the ceremony site transformed from just another space to one perfectly crafted for Ali and Nick to say 'I do'. Getting married at the beautiful Sherrill's Inn just southeast of Asheville was filled with meaning. Ali wrote; "My mom grew up with some of the family and remembers going to Sherrill's Inn when she was younger for square dances. She was the one who suggested looking at the venue which I had never heard of and when I got there I absolutely fell in love with the place. Nick and I both loved the old farmhouse, all the secret gardens, the horses roaming around and most of the mountain views." For Ali, one of the most special moments from their day was during the ceremony itself. "One of my favorite memories from the wedding was looking out and seeing all our family, friends and loved ones in the crowd. It was a perfect beautiful day and couldn't have asked for anything more." How perfect are bubble exits!? Always perfect. One of the sweetest things from their wedding was the way they 'released' guests from the wedding to join the reception. After their bubble send-off, Ali and Nick returned to greet and hug each and every single guest, row by row. We had never seen a receiving line quite like this, and it was so lovely to watch everyone react and celebrate with the bride and groom in such an intentional way. With golden light streaming from behind the trees, we were able to photograph the bridal party. Again, I can't articulate enough how wonderfully important the pictured people are. From Nick's father to Ali's sister and life-long friends, these are the people who have been with Ali and Nick through the best of times and most challenging of times. With full support and love, these are the people they trusted with the responsibility of their day, and the ones they wanted standing right beside them. I almost finished the recap of their day the without sharing some of these family photos below. As I shared above, we almost never share photos from formals! However, it would feel a bit in-authentic to do so, especially because of how important and special each of these are to Ali and Nick. She valued family and photos so much, she encouraged her extended family to get together for photos (an opportunity that was rare for some)- and the result was pure magic. I thought it was so humble, so selfless how Nick and her weren't even in some of these photos - it was so important to her, they took time out of their own wedding to talk, to share, to coordinate to make sure beautiful photos were taken. Yes, Ali and Nick's reception was truly a celebration! With music and dancing and smores and drinks, hardly did I ever see anyone sitting down. With their guests watching, Ali and Nick danced together for their First Dance. To Nick, this was one of his favorite moments from their day. As always, we had the pleasure of pulling aside Ali and Nick for a few photos for sunset. Sometimes, 'sunset' can be tricky - the sky doesn't always cooperate with vibrant colors and clear evenings. However, honestly? I love the unpredictability. The fact you can take a couple- completely unique by themselves- and place them in a setting that is also unique based on each passing day, and make something new each and every time... there is something truly beautiful about that end result. And truly, Ali and Nick came together so seamlessly. The way they interacted- so gentle, so true- was beautiful. Full of joy from their ceremony and love from their family and friends, they were absolutely giddy and gave us the sweetest excuses for more photos. Ali and Nick have known each other for years. Almost nine years ago, in 2009, Ali and Nick were introduced through mutual friends. They've been together since then, and in early 2017 Nick proposed to Ali at Bald Head Island. Already, Nick knew how important family was to her. In one of the first steps of true intention, he planned the proposal to happen during a Family Reunion. "...We got to share our exciting news with everyone after the proposal on the beach and celebrate with family we do not get to see very often," Ali shared with me. Can you think of a better way to celebrate your engagement than with your closest family nearby!? With the sun setting quickly, the toasts were given. We heard stories from years ago, shared laughter and tears. Surrounded by twilight and the dearest people, they reminded and shared together. Ali and Nick, what a gift it was to be a part of your day at Sherrill's Inn! It seems fitting to end this post with a few words from their first dance itself; with the very words Ali and Nick choose to sway together with and dream together with. I see my future in your eyes"